I used to be averse of making steamed puddings before last week. Even despite how much I adored eating them. To me there was always some magic about their moist texture, which is so dense and soft at the same time. These lemon puddings changed this and I can't tell you how happy it makes me. That's how it would happen. I'd open my favorite Le Cordon Bleu Dessert Techniques and flip through the pages till I bumped into the mind blowing picture of steamed pudding slice soaking in warm jam and creme anglaise. I'd start reading the recipe. OK, where do I get this special pudding basin? Would I really be able to make live this construction of paper, foil and thread for the cover? After all, are you really serious about those 2 hours needed for cooking? That's where the idea would normally die. Once, however, I had a talk about that with Elena Spirina and the Meringue making class and half-a-teaspoon cooking school. The first idea I got was that one can actually use ordinary ceramic cups to make steamed puddings and fix the foil cover with, say, rubber band. The second idea was that if you make individual puddings, they take way less time to cook - especially important for those impatient hungry people like me. 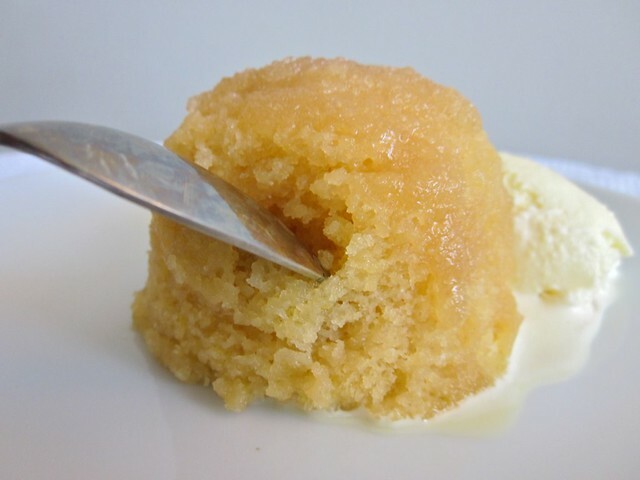 So when the next time I bumped into the steamed lemon pudding in Nigella's How to Be a Domestic Goddess I gave it a go and made individual puddings. It was so much worth it. I got all this lovely texture and I must admit, I enjoyed the cooking. Combine all the sponge ingredients at room temperature in a food processor till you get a smooth batter. It should have pouring consistency, it it's too thick, add 1 more tbs of milk. In a small saucepan combine the syrup ingredients. Heat stirring till the sugar dissolves. I used ordinary ceramic tea cups to make the puddings. Butter the cups slightly. Pour in the syrup. Then spoon in the batter. Cover the cups with lightly buttered pieces of foil and fix them with rubber bands. Place the cups in a large saucepan. Pour in enough boiling water from a kettle to cover 2/3 of the cups' hight. Cover the pan with a lid. Set it over high heat and bring to boil. Reduce the heat to low and steam for 40 minutes. Take the pan off the heat. Carefully take the cups out of the water and let rest for 2 minutes. Remove the foil covers and turn the puddings on the serving plates. Serve right away. Vanilla ice-cream or creme anglaise both seem to be perfect to complements to this dessert. Those look good! Will have to try.